By this point, most of us have heard the simply startling news that bed bugs have spent the past couple decades developing the ability to resist the pesticides we’ve been relying on to kill them. A 2011 study found a Richmond bed bug population able to withstand 111 times the amount of one type of pesticide compared to a lab-raised bed bug population and 5,200 times the dose of another type of pesticide. These numbers are certainly disconcerting, but how are they doing it? How are these bed bugs able to resist something that at one time nearly eradicated them? The Richmond bed bugs from the 2011 study had been found to have a strong resistance to pyrethroids, a class of insecticides that work by paralyzing the bug. The pesticide prevents the sodium channels where nerves meet and communicate to close, causing a constantly-firing nerve which paralyzes and eventually kills the bed bug. Modern bed bugs, including the Richmond population, have been found to have two methods of defense against these pesticides. The first defense they have is a gene that causes their bodies to produce insecticide-stopping enzymes. These enzymes are designed to break down the insecticide before it can reach the nerve, therefore necessitating the increased dosage requirements in order for these insecticides to be effective. The second defense the modern bed bug has against insecticides is another mutation in their genes which acts to camouflage the bug’s nerve endings. These nerves are usually targeted by insecticides but are harder for them to recognize with the mutation. Luckily, Northwest K9 Bed Bug Detectives uses a heat-based treatment and does not rely on pesticides! 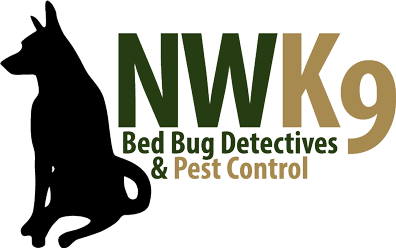 Contact us, your favorite bed bug exterminator in Seattle.